We want to say a HUGE thank you to Hannah, who embarked on the rather daunting task of putting on a quiz to raise money for Operation Orphan, and more specifically the work in Ghana. Hannah has been on a Global Expedition trip with us and has also helped us out with our Keep a Child Warm packs for the last couple of years, even though its meant a trip up to Nottingham from her home in Histon, Cambridge. ‘I wanted to be able to support Operation Orphan and the children they help so decided to hold a fundraising quiz for my Extended Project Qualification. I have helped for the past few years at other quizzes, but never had the challenge of organising my own – it wasn’t until I was a few weeks into the preparations for my quiz that I realised just how hard work (and time consuming) it was going to be! I set myself the target of selling 80 tickets, which I mainly sold to neighbours and people in the village. In the end had 105 at the quiz! This was great and really helped with the atmosphere of the evening. I didn’t just want to raise money, I also wanted to raise awareness of Operation Orphan. I knew that many people who were attending had not heard of or knew little about the charity. There are so many different charities out there and I wanted people to know why I had chosen to support Operation Orphan. To get the message across I showed the Keep a Child Warm 2012 video as part of one of the quiz rounds. Another round was based on the countries which Operation Orphan works in. 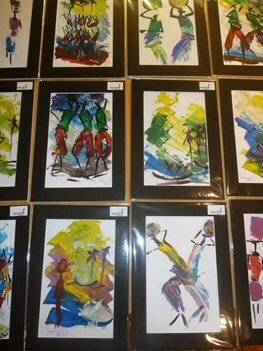 To supplement the ticket sales I also sold some African paintings I had been given (painted in at the King’s Village in Ghana), which I mounted. We also had a raffle and there was cake and nibbles. We are so proud of Hannah and thrilled that she has raised so much for the projects in Ghana. This money will go towards the work at the Nutrition Centre, caring for malnourished and very sick children, providing places for orphans to attend school at the King’s School and into the Water and Sanitation Programme, creating safer environments for the children to grow up in.